ATI Town Hall Blog: Switch to the Enhanced K-12 Student-Parent Center Today! Switch to the Enhanced K-12 Student-Parent Center Today! Join the Galileo users who have already made the switch to our enhanced K-12 Student-Parent Center and begin to enjoy the benefits it provides. Discover the sleek new interface designed to easily communicate information between students and teachers and between teachers and parents. Communications to students and parents can focus on curriculum and instruction including scheduled lessons and assignments, on assessments and assessment results and on instructional resources for home use. Experience for yourself the enhanced Dashboard, user-friendly icons, responsive design accommodating use on various screen sizes, search capabilities, and the integration of Google Translate. Galileo will transition completely to the new K-12 Student-Parent Center this summer but you can make the switch today. Learn how to switch to the enhanced K-12 Student-Parent Center. Learn how to preview the enhanced Center. Read more about the enhanced Center. 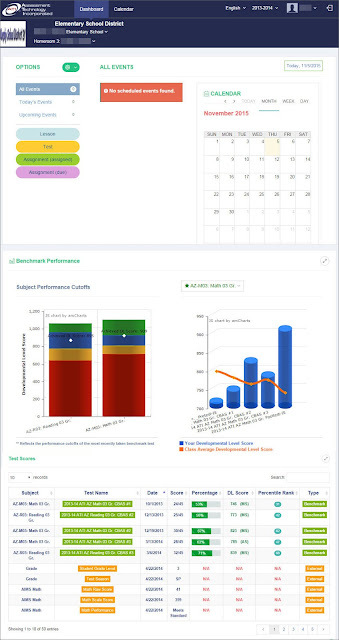 The K-12 Student Parent Center provides a detailed assessment history on all completed benchmark, formative, and external assessments and also contains all available lessons and assignments so that they can be easily accessed by students and their parents.